Kids need practice producing the Spanish they have learned. However, speaking practice can be hard to structure. It is much easier to set up situations where children are understanding Spanish than situations where they are producing it. 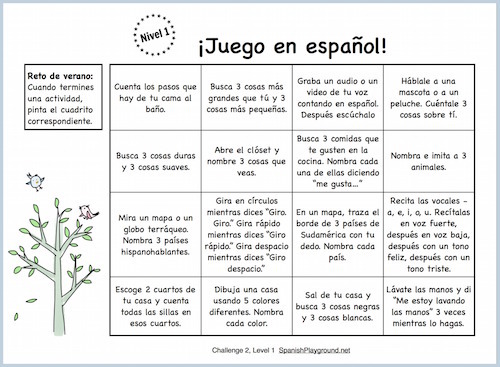 These quick Spanish speaking practice ideas encourage children to produce words they know. The Spanish speaking practice activities center around themes – numbers, food, animals, colors, body parts, etc. All of the activities take only a few minutes, and none of them need special materials. The activities are designed to do independently. However, doing them together is fun and allows children to hear key words as parents or teachers model possible answers. These Spanish speaking practice activities allow children to answer using words they can easily produce. In other words, the activity might ask them to name 3 animals, but the child chooses which animals. This structure builds confidence and also personalizes the practice. This is our second set of short speaking activities for independent practice. Try the first set of easy Spanish speaking activities, too. The Learn Spanish with Pictures activities also provide kids with the opportunity to speak Spanish with the support of a photo and questions. Another excellent way to practice speaking is our sets of general knowledge questions in Spanish. We call the questions Una preguntita, and they are at a variety of levels. They are fun for games or simply to read and answer together. 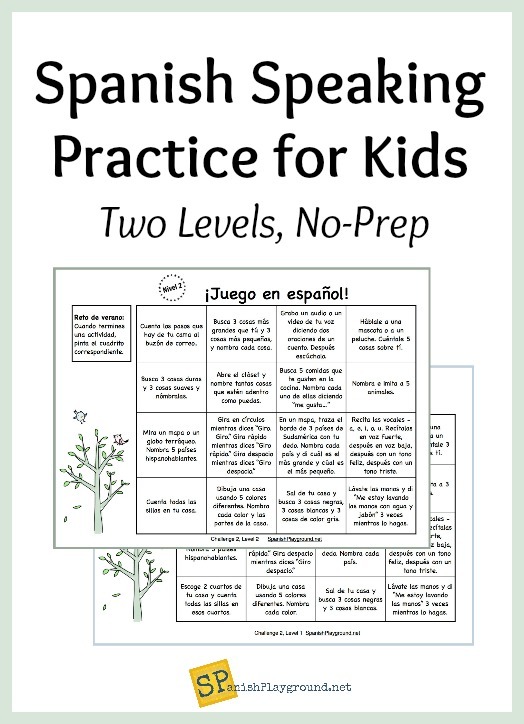 There are two levels of Spanish speaking practice activities in this download. The first level asks a child to respond with a few words, while the second level calls for more vocabulary. Both levels draw from the same themes, so you can combine activities from different levels. For example, your child may know lots of food words and have fun doing a Level 2 activity about food. On the other hand, she may only know a few body parts, and have more fun doing a body part activity from Level 1. 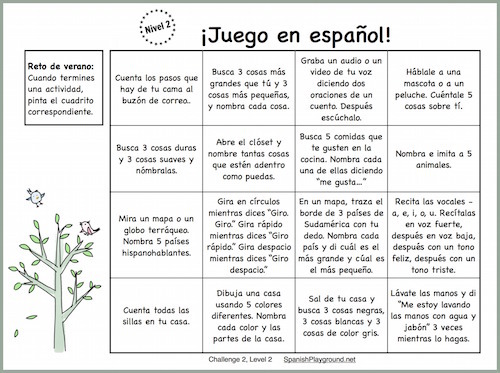 This Spanish speaking practice is set up in a bingo card challenge. Kids can try to do all the activities in a row, coloring each square as they complete it. Another option is to try to complete the entire challenge, coloring all the squares. These activities are also available in English, as clarification for parents or caregivers with limited Spanish. They are also fun speaking practice for children learning English.